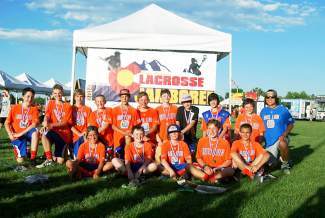 Congratulations to Vail Valley Lacrosse Club's U13 blue team for winning its division at the Rocky Mountain Lacrosse Jamboree. Pictured standing are Jonathan, Tommy, Ian, Kenny, Cameron, Hans, Noah, Wes, Matt, Billy, coach Tom. Seated are Reese, Joseph, Parker, Cole and Koby.